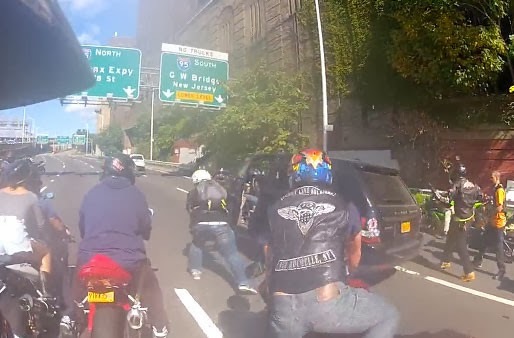 More bikers are now under arrest in connection with the SUV vs. Motorcycle incident in New York. So far, eight men have been charged in the assault. The AP reports one was an NYPD undercover detective, identified officer Wojciech Braszczok, and said he turned himself in to face riot and criminal mischief charges for allegedly banging on and breaking the rear window of the SUV. The detective waited four days before coming forward to the NYPD and he allegedly made false statements about his involvement. 28-year old Kaliq Douglas was charged with first-degree gang assault. Bail was set at $25,000 cash or bond. Douglas is the eighth rider to be arrested. The man who shot the YouTube video, Kevin Bresloff turned on his helmet camera shortly after the riders encountered the black Range Rover, says his lawyer, Andrew Vecere. "From speaking to him, what he saw - or what he believes that he saw was a water bottle come out of the sunroof of the car," Vecere said. Vecere said, "It was supposed to be a leisurely Sunday ride through New York City. Some in this group of motorcycles were intentionally slowing down other cars on the road so that the rest of them could pass safely."